Already ranked by some as number one in nutrition among all vegetables, the traditional sweet potato can be nutritionally supercharged, literally, with a simple, inexpensive electric current treatment that increases its content of healthful polyphenols or antioxidants by 60 percent, scientists said here today. 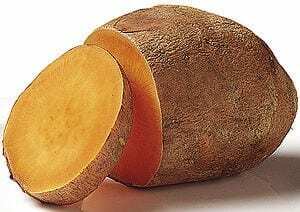 Their report on the first electrical enhancement of sweet potatoes, a dietary staple since prehistoric times, was part of the 244th National Meeting & Exposition of the American Chemical Society, the world’s largest scientific society. The meeting, with 8,600 reports on new advances in science and a projected attendance of 14,000, continues through Thursday. “Many people don’t realize it, but sweet potatoes are one of the world’s most important food crops,” said Kazunori Hironaka, Ph.D., who led the research team. The electric current apparently stresses the potatoes, and they produce more polyphenols as a protective measure. The team suspected that the same effect would occur with sweet potatoes, but until now, nobody had tried. In the new study, Hironaka and colleagues used the same approach, putting sweet potatoes into a salt solution that conducts electricity, and then passing various amounts of electric current through the water and the potatoes for 5 minutes. The best results came with 0.2 amps of current, which increased antioxidant activity in the potatoes by 1.4 times and total polyphenol content by 1.6 times compared to untreated potatoes. He noted that untreated sweet potatoes already are high in antioxidants, with 7 times more polyphenols than other potatoes.